Christmas is coming and we worked hard to get you some new features as a an early gift. This time we were working mainly on the design of the whole web interface to be the most user-friendly. But we also added some news. We know that some of your employees may not have an email address or you just simple don't want them to have access to their account. So we withdraw the necessity of adding employee with email address. Now you can add employee only by Name and Surname and he/she can use our application right away. Other new feature is also about employees. Most of the companies have departments and every department has their own manager. You can do that now in Frekr too. Firstly you will add Groups according to the departments in the section Admin-Groups. Then you can add employees to the groups directly and also in the account editation of each employee or while creating a new one. One employee can be present in more groups. You can assign a Manager to every group (employee with Role Manager), this manager can view all the statistics and employees for the particular group. One manager can be assign to more groups. We hope these new features and also the new design will simplify using of our application. If you have more suggestions let us know on email address support@frekr.me. We are trying to improve the application according to your demands and wishes. This week we have launched some important features! We are often receiving questions about application for another operating systems than Android (mainly for iOS). We will be glad to fulfill all the wishes but for iOS we can't develop the application at the moment. The NFC technology even it is built in new devices from Apple isn't allowed to be used in the way we are using it in our application on Android. We only can develop an employee mobile application. Right now, employees who want to use our mobile app on another systems (iOS, Windows, BlackBerry etc.) can use our Web App to push In or Out right from mobile web browser after loging into their account. The Administrator must allow the mobile application to the employee to start using it. The utilization is the same as in the mobile app, employee can also add GPS location. Other employees can also use it in their computers to log in or out in or outside the workplace. In this case can be used GPS location too. We added also possibility of payment via bank transfer (available only for Czech and Slovak companies). For the bank transfer apply the same rules, minimum payment is 100 CZK or 4 EUR. Important is to fill variable symbol so we can pair the payment to your account. After the amount is credited to our account credit will be increased in 30 minutes and you'll be able to download invoice. When you add credit for the first time your account will be transfered to paid account Standard and you are paying each month for every active employee during that month. Now you can deactivate the employee in case of need (termination of employment, interruption of employment - seasonal workers). You still have all the statistics about the employee in your account, he/she won't be fully deleted. But he/she cannot loging to their account, use QR code or NFC tag to log or use mobile app. Deactivation can be founded in the employee's account editation. You can activate the employee back when needed. To the statistics we added possibility to download a report of all events also with GPS coordinates. You can download it to PDF eg. for control by the customer or boss. For those who are using the QR codes for employees authetication we improved the export and print for all employees together. This feature is in the section Admin-Employees. We are preparing more new features, if you would like to share with us your suggestions please contact us on the email address support@frekr.me. We will welcome your feedback! How the application works? How to setup? On this scheme you can see how the application works and how to use it in ordinary company. Na tomto schématu vidíte přehledně, jak naše aplikace funguje a jak se používá v běžné společnosti. We want you to setup the application by yourself in a few minutes. We will guide you through the basic setup on this video and you can also see how it works. You will find useful information also in the web interface. After first signing the Help window will pop up which is designined to also help you with the setup. Please read through it, it will help you with navigation. You can close the help window and return to it anytime in the leftside menu "? Quick help". On each part of the web is different help guide. If you still need our help, the best is to open a chat window in the bottom right corner and ask us anything. We are online each weekday from 9 AM to 5 PM CET but you can write a message to us even if we are offline, we will get back to you as soon as possible. Second possibility is to write us an email using email address support@frekr.me or using contact form on our website. If you will add your phone number we can solve the issue faster. Since last year we are developing the application Frekr, which is a modern replacement for classical, outdated and expensive attendance systems. 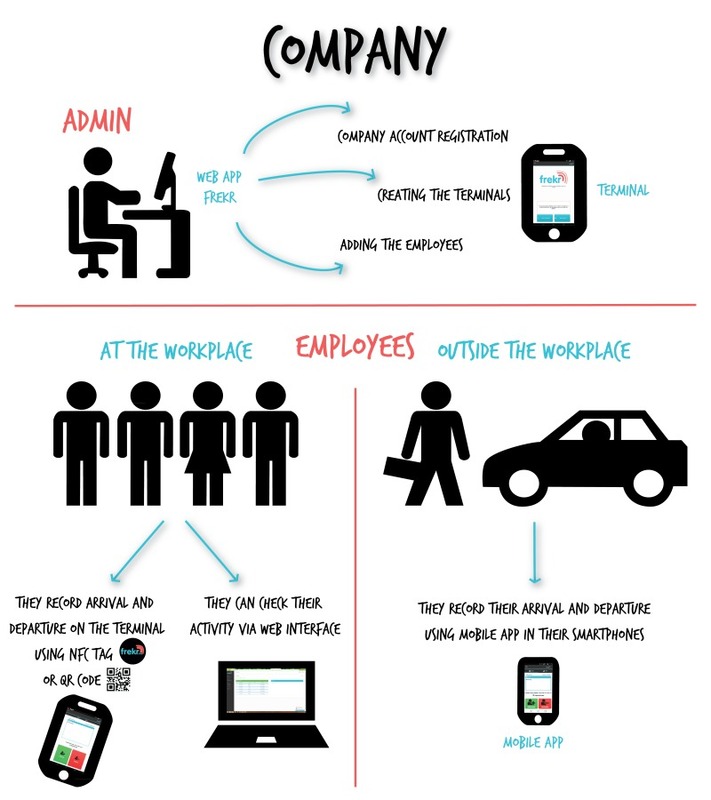 Frekr will help you to monitor attendance of your employees at our outside the workplace. All the statistics you can view in real time via web browser. You can try Frekr for free for up to 5 employees for unlimited time. If you are satisfied and have more employees you can upgrade to paid version anytime. Then you are paying per employee per month. Simply register and start now! Frekr is easy to use and you will setup the application in few minutes. No need to buy additional software or hardware. Frekr is using modern technologies in your smartphone or tablet. You can monitor the attendance of employees in the office or outside the workplace (on the meeting with client, business trip, etc.). All the statistics can be used for another programs and applications (accounting or payroll programs). Using is very simple and user friendly for employees and even the administrators. You only need a smartphone or tablet with camera and you can start right away! You will place tablet or smartphone with application Frekr to the workplace, this device will be an access terminal. Every employee will use access card (NFC) or QR code to authenticate. Every employee can have access to web interface with their statistics. Employees working outside the workplace can download application Frekr to their smartphone or tablet and pair it with their account. After that they can push In or Out through their own device and even with GPS location. Application also provide a simple task assignement. Administrator or Manager has a complete view of employees' statistics with number of worked hours. More information about application can be found on website frekr.me. For authetication of employees on the terminal we are recommending to use NFC technology. NFC technology offers transfers among active NFC device (reader) and passive device (NFC tag). Most of the newest types of smartphones and tablets have built in NFC. You can order NFC tags directly from our application in your account. We will gladly answer all of your questions about our application on email address support@frekr.me. We will also help you with choosing the right device and accessories. We will welcome your feedback and suggestions or comments.